We at Jernigan Chirorpractic have helped hundreds of people achieve their healthcare goals. No matter if it's common low back pain or headaches, or if it's to optimize your body's physical and healing potential, we can help. "I've had low back pain for years, thanks to Jernigan Chiropractic I'm now pain free." "I was in an accident several years ago. It led to chronic neck and low back pain and I had headaches every day. Dr. Jernigan helped me get out of pain and stay out of pain." "Working at my computer at work caused so much stress in my neck and shoulders. I thought it was something I had to live with. Dr. J keeps helps release the tension in my spine with regular chiropractic adjustments." "I thought back pain was just a way of life for me. Dr. Jernigan thouroughly explained to me my problem and what it was going to take to get out of pain. I've been pain free for 6 straight months." "I've had migraines for as long as I can remember, medications would offer only temporary relief. My medical doctor suggested trying chiropractic, I wish I would have done it sooner. No migraines in months. 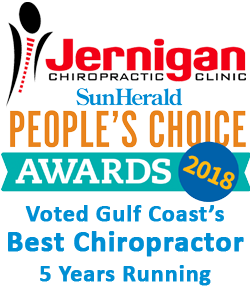 They are not ruining my quality of life anymore thanks to Jernigan Chiropractic Clinic."